A client from Deep Cove recently contacted Ralph’s Radio about upgrading his 2008 Monterey 194FS audio system. We started working on the client’s boat last year by installing four speakers and a new radio. As with most music enthusiasts, once you get the “bug,” future upgrades are an inevitability. Let’s look at what we’ve provided for this client. The Fusion radio upgrade was installed in the factory radio location. A Fusion full-featured remote was added on the captain’s side of the boat. We started the project by removing the factory radio and speakers and promptly relegating them to the circular disposal repository (garbage can). A Fusion MS-UD650 radio serves as the upgrade to the factory unit and provides a safe and secure location to store the client’s smartphone inside the radio. With dual USB inputs, dual auxiliary inputs and Bluetooth audio streaming, the client can listen to any source imaginable. We used a Clarion CCA-USB extension to provide access to the rear USB connection on the source unit. To make using the radio easier when at the helm, we mounted a Fusion MX-NRX300 remote just forward of the throttle control. The remote includes an LCD screen to make selecting sources easy. Both Fusion units have fully water-resistant front panels and are constructed using materials that won’t disintegrate when exposed to UV rays from the sun. The initial installation included upgrading the factory speakers with Wet Sounds coaxial speakers. The two additional 8″ coaxial speakers and 10″ subwoofer were added to the stern of the boat. Passengers outside of the boat have great audio too, now, thanks to the wake tower speaker addition. The first stage of speaker upgrades included two sets of 6.5-inch Wet Sounds XS-650-S-RGB speakers. The speakers replace the factory units and fit directly into the original openings in the bow and cockpit of the boat. In our most recent visit to the boat, we added a set of Wet Sounds XS-808-S 8-inch coaxial speakers to the rear of the cockpit. A REVO-10-FA 10-inch subwoofer adds low-frequency reinforcement to the system. We mounted the 8-inch coaxial speakers and the sub beneath the rear bench to fill the boat with sound. The final speaker addition was a set of black Wet Sounds Icon 8 tower speakers to the wake tower bar. We used a set of TC3 mounting brackets with a swivel feature so the client can turn the speakers if he chooses. The tower speakers make it easy for whoever is at the end of the towrope to enjoy the music. The subwoofer and tower speakers are powered by the SDX6 amplifier. The HTX6 amplifier powers all of the on-board coaxial speakers. Both of the amplifiers take up almost no usable space in the boat. A pair of six-channel Wet Sounds amplifiers powers the Monterey 194FS audio system. An HTX 6 provides up to 100 watts to the front and rear 6.5-inch speakers and the 8-inch coaxials. An SDX6 amplifier powers the subwoofer and the wakeboard tower speakers with an awesome 585 watts each. We used Wet Sounds Wet Wire RCA interconnects, speaker wire and power wire to deliver signals and power through the new audio system. As with every installation Ralph’s Radio performs, all electrical connections and wiring are protected, routed safely and secured in place to ensure maximum performance and reliability from the system. The Heise light bar will help the client see better when the sun goes down. The client goes boating during the evening a lot. Even with the sun setting after 9 p.m. during the summer, the client wanted a way to make sure he’d be able to get back to the marina safely at dusk. We mounted a Heise HE-MSR14 marine-grade, 14-inch, single-row LED light bar to the top of the wakeboard tower. The light bar features six 10-watt CREE LED’s that provide 4800 lumens of output. 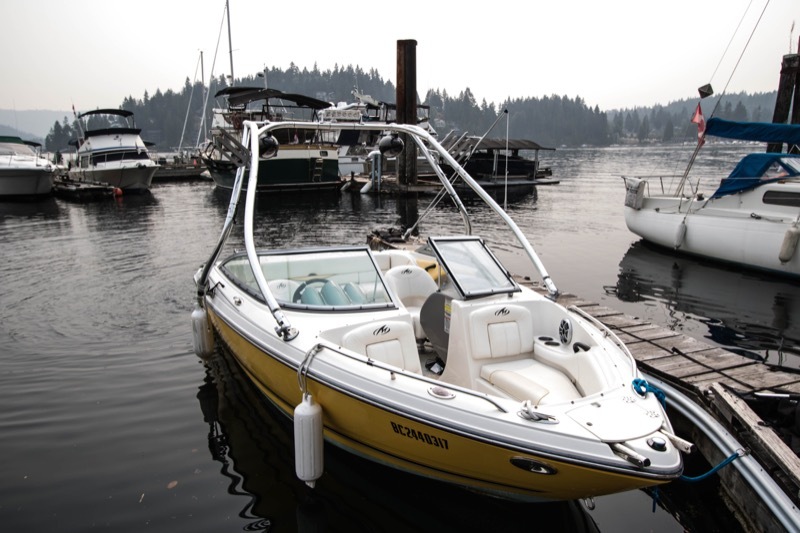 With a combination of spot and flood patterns, the extra light makes it easy for the client to see what’s ahead of the boat when cruising back to the marina, then dock the boat safely once in its berth. The client loved his audio upgrades! With the upgrades complete, it was time for the client to hear the latest improvements to his sport boat. The addition of the extra speakers brought the system to life, and the client was impressed with the amount of bass the system produced. He was looking forward to testing the new light, too. If you are interested in sound system or lighting upgrades for your boat, contact Ralph’s Radio in Vancouver or Victoria. Our team would be happy to help design a solution that meets your needs and exceeds your expectations. For more information, or to schedule a consultation, send us an e-mail using our online contact form.